The amazing underwater scenarios around New Providence Island are a true paradise for divers and we invite you to experience this for yourself. Explore underwater walls and teeming reefs with us on our two tank morning dive. This tour has been created for the certified diver who is looking for an exciting adventure under the sea! 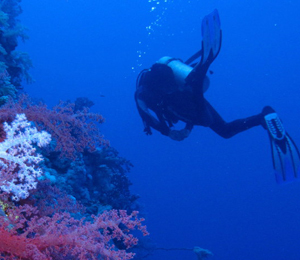 Regardless of how many dives you have completed, our diving locations will still dazzle you! Our diving instructors and staff are highly qualified and familiar with some of the world's most rewarding diving locations. We set out every morning to two of our carefully selected diving locations. Once we have decided on where to go based on the weather and your wishes, we will head out to locations such as Nassau's Lost Blue Hole. This underwater hole boasts a depth of 200 feet and is home to an incomparable variety of marine creatures. Our dive goes down up to 80 feet where we can observe a variety of shark species and other fascinating underwater life, such as sponges and beautiful corals, dazzling tropical fish, turtles, stingrays, and eels. Other diving sites include the Barracuda Reef, an amazingly well-preserved reef system, and the Traveler's Rest Wall, a fascinating underwater canyon full of corals and other aquatic life. We might also visit a ship graveyard with freight boats wrecks that have become habitats to a wide variety of sea life. Our staff is always ready to answer your questions about diving or about the region and you will be with experts at all times! Regardless of where our two-tank morning dive will take us, we assure you that you will have the diving experience of a lifetime! I have been to the Bahamas many times, but Bahama Divers Two Tank Morning Dive is one of my favorite trips! It includes everything that everyone should do here. As a Bahamas veteran, I can say only the best about this experience!